Yes spring spring showers are a necessary evil, but it doesn't just shower from March to May, it pours! Clothes soaking, shoe splashing rain and it can ruin the perfect outfit if you're not prepared. So you find a stylish trench to protect your frame, a hat that doesn't make you look like a two-year old or the Gordon Fisherman, and the perfect pair of rubber boots. Success! You reach your destination high and dry, but what about your purse? Nothing ruins my day more than a partially soggy sac. Hunter has a solution and why not? You love their rubber boots so why not rock their rubber bag. 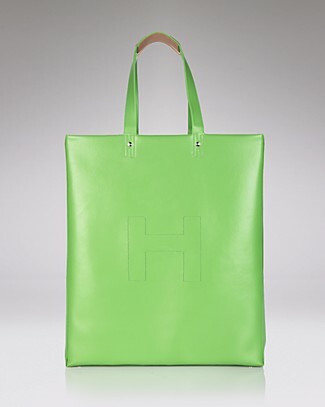 The Hunter Tall Original Rubber Tote is both practical and stylish. It's available in a few colors but I like the lime because it goes well with springs colorblocking trend.